Two passenger trains have collided in north-west Turkey, killing a train driver and injuring seven other people. The accident occurred when one train failed to stop at a signal near the town of Bilecik and rammed into the other, stationary, train. The provincial governor said an electrical fault caused the accident but the regional rail chief said the signalling system was functioning. Both trains were travelling between Istanbul and the city of Eskisehir. The injured reportedly included two other members of the trains' crews, and several passengers who were sitting at the front of the train that was moving. Bilecik Governor Musa Colak said engineering work was being carried out in the area at the time. "Because of this work, the electricity was cut off, which prevented these trains from being alerted about the presence of another train on the track," he told the Anatolia news agency. But Hasan Gedikli, head of the railway system for the region, said the signalling system seemed to have been functioning at the time and that officials were investigating why the train did not stop. Correspondents say Turkey's government has been working to improve the rail system, which is plagued by problems with signals, rolling stock, equipment and tracks. 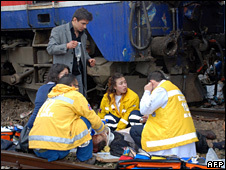 In 2004, a newly introduced high-speed train from Istanbul to Ankara derailed, killing 37 people and injuring 90 others.